Hello and Happy Tuesday! Thanks for stopping by my blog! 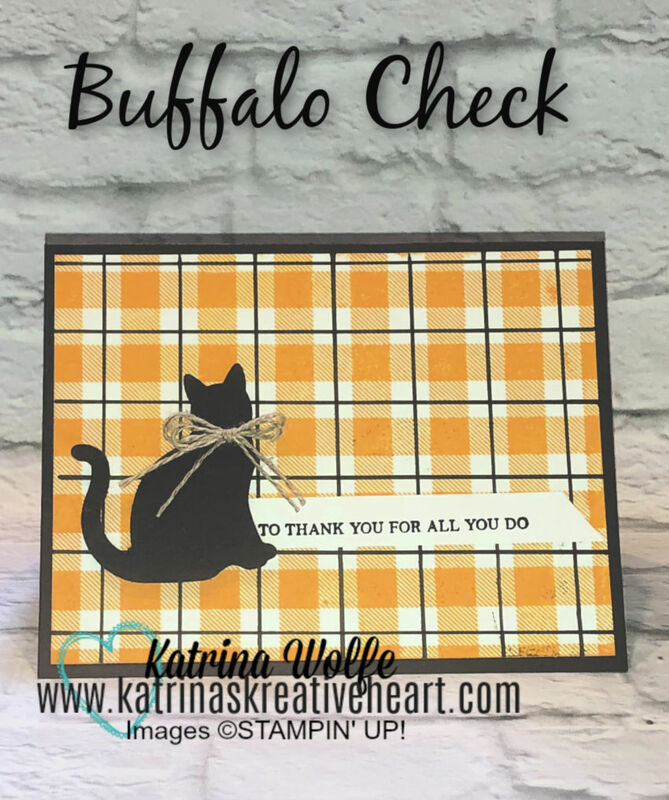 I have a fun project to share with you today using one of my favorite stamps, the Buffalo Check background stamp from Stampin' Up! 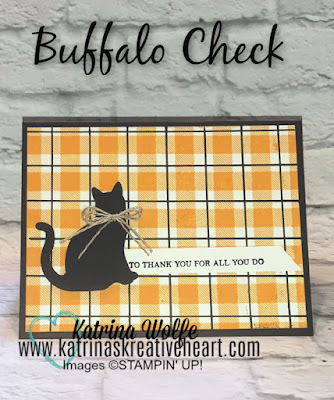 I just love the versatility of this stamp and in today's project, I made it into a plaid background by using a ruler and a Stampin' Write marker. To begin, I started with a standard card base of Early Espresso cut 8.5" x 5.5", I then cut a piece of Whisper White 4" x 5.25" and stamped it with the Buffalo Check background stamp and Mango Melody. Then, using a ruler and the Early Espresso marker, I drew lines down the center of the Buffalo Check rows containing white squares, I then turned the paper .25 turn, and repeated with the ruler and the marker. I adhered this panel to the card front then punched the cat from a scrap piece of Early Espresso and added a double bow from Linen Thread to the cat's neck. I then stamped the sentiment from Rooted In Nature using Early Espresso ink onto a piece of Whisper White cut .5" and trimmed it down and added to the card front. That completes today's project. I hope you enjoyed it and I hope it inspires you to pull out your Buffalo Check stamp and begin playing with it. See what other patterns you can come up with and feel free to share. I'd love to see what you do.